Everybody knows what a constructor is i.e, constructor create new object but the purpose of this post is cover detailed concepts about constructor which includes rules for creating and defining constructors, constructor chaining and what is the need of private constructor and when does compiler provide the default constructor for us. Objects are constructed. You can't make a new object without invoking a constructor. In fact, you can't make a new object without invoking not just the constructor of the object's actual class type, but also the constructor of each of its superclasses. 3 Steps of object declaration, creation and assignment. Assign the new object to the reference. Q. Are we here calling a method name Latte()? Because it sure look like it. No We're calling the Latte constructor. A constructor does look and feel a lot like a method, but it is not a method. It's got the code the run when you say new. The only way to invoke a constructor is with the new keyword. Have you noticed something is missing? There is no return type! What we get from this, is that it's very common and may be desirable for a class to have a no-arg constructor, regardless of how many other overloaded constructor is present in the class. Oh, yes, constructor can be overloaded. Consider the basic animal hierarchy where we assume Horse extends Animal and Animal extends Object. Horse constructor is invoked. Every constructor invokes the constructor of its superclass with an (implicit) call to super(), unless the constructor invokes an overloaded constructor of the same class. Animal constructor is invoked because Animal is the superclass of Horse. Object constructor is invoked.At this point we're on the top of the stack. Object instance variables are given their explicit values. By explicit values, we mean values that are assigned at the time the variables are declared. like "int x = 5", where "5" is the explicit value (as opposed to the default value) of the instance variable. Animal instance variables are given their explicit values. It's legal (but stupid) to have a method with the same name as the class, but that doesn't make it a constructor. If you see a return type, it's a method rather than a constructor. If you want a no-arg constructor and you've typed any other constructor(s) into your class code, the compiler won't provide the no-arg constructor for you. A call to super() can be either a no-arg call or can include arguments passed to the super constructor. Only static variables and methods can be accessed as part of the call to super() or this(). Abstract classes have constructors, and those constructors are always called when a concrete subclass is instantiated. The only way a constructor can be invoked is from within another constructor. In other words, you can't write code that actually calls a constructor. You try by yourself to check this. In this case compiler won't put default constructor. In this case also compiler won't put default constructor. It might look like the compiler won't create one, since there already is a constructor in the latte class.What's wrong with the latte() constructor? It isn't a constructor at all! It's simply a method that happens to have the same name as the class. If you have 2 constructor that took only an int, for example, the class wouldn't compile. What you name the parameter variable doesn't matter. It's the variable type and order that matters. A constructor that takes a string followed by an int, is not the same as one that takes an int followed by string. Overloading a constructor is typically used to provide alternate ways for clients to instantiate objects of your class. For example, if a client knows the animal name, they can pass that to an Animal constructor that takes a string. But if they don't know the name, the client can call the no-arg constructor and that constructor can supply a default name. Five different constructor means five different ways to make a new Latte object. The key point to get from this code example. Rather than calling super(), we're calling this(), and this() always means a call to another constructor in the same class. OK, fine, but what happens after the call to this()? Sooner or later the super() constructor gets called, right? Yes indeed. A call to this() just means you're delaying the inevitable. Some constructor, somewhere, must make the call to super(). 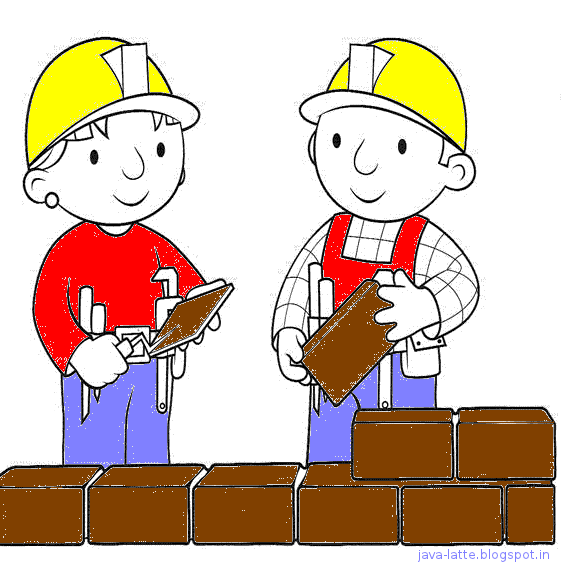 The benefit of having one constructor invoke another overloaded constructor is to avoid code duplication. The call to super() must be the first statement in each constructor.For instance, following code won't compile. If superclass constructor has arguments? Can you pass something in to the super() call? Of course. If you couldn't, you had never be able to extend a class that didn't have a no-arg constructor. All animal have a name. There is getName() method in class Animal that returns the value of the name instance variable. The instance variable is marked private, but the subclass inherits getName() method. So here is the problem Horse has a getName() method, but does not have the name instance variable. Question is how Animal part get the name??? 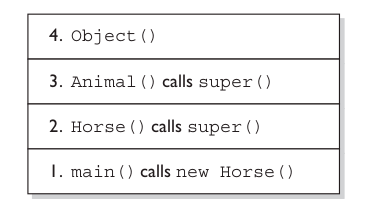 The only reference Horse has to the animal part of himself is through super(), so this is the place where Horse send the name to the Animal object. One last point on the whole default constructor thing, constructors are never inherited. They aren't methods. They can't be overridden (because they aren't methods and only instance methods can be overridden). So the type of constructor(s) your superclass has in no way determines the type of default constructor you'll get. Some folks mistakenly believe that the default constructor somehow matches the super constructor, either by the arguments the default constructor will have (remember, the default constructor is always a no-arg), or by the arguments used in the compiler-supplied call to super(). So, although constructors can't be overridden, you've already seen that they can be overloaded, and typically are. Q1. Doesn't the compiler always make a no-arg constructor for you? No. 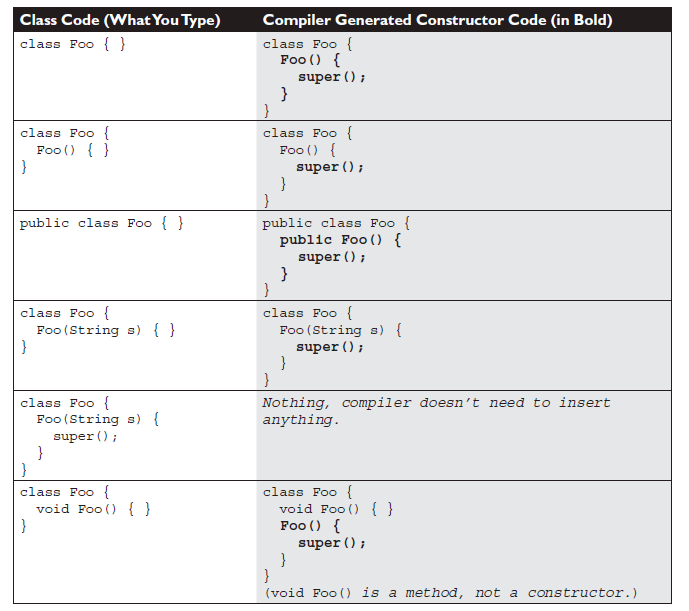 The compiler gets involved with the constructor making only if you don't say anything at all about constructor. If you write a constructor that takes arguments, and you still want a no-arg constructor, you'll have to build the no-arg constructor yourself. Q2. Do constructor need to be public?